Pretty excited about this and I think you will be too! What can be easier than an super simple brunch, or a meal you can put together, tuck in the fridge before you head off for work and tuck in the oven when you get home? Since I’m such a big fan of breakfast for dinner – this is a total winner in our family! Using brioche bread, eggs, milk and a few spices it’s such a simple thing to put together. The french toast is sweet, made even sweeter by the delicious (and easy) homemade jam. This meal screams spring and with all of the beautiful flowers popping up (like these roses in the background) it’s definitely time to celebrate the season! 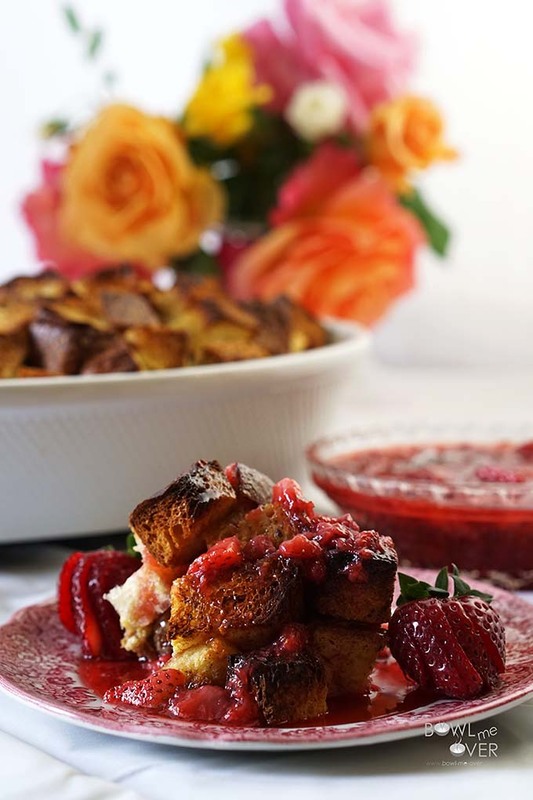 Drizzle the Strawberry Jam right over the Baked French Toast! After baking, simple drizzle the jam all on top. 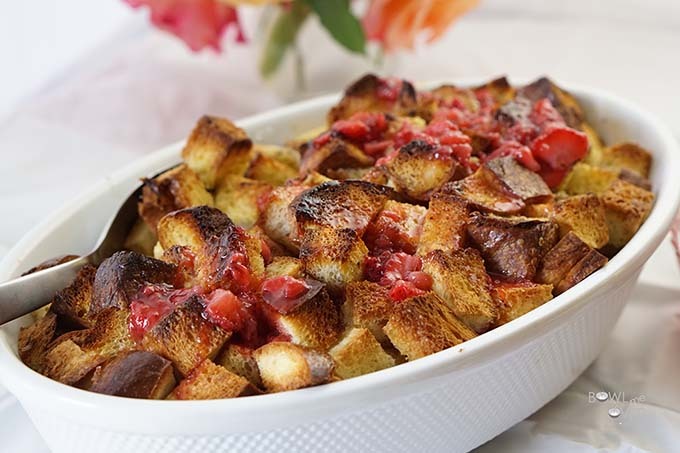 The jam takes just 5 minutes on the stove so you make it while the French Toast is baking and while everything is warm, just pour it over this beauty and you will be ready to eat. And since those delicious fresh strawberries are beginning to show up in the markets, it’s a wonderful opportunity to showcase them in the amazing spring meal! Spray your casserole dish with non-stick spray. Slice and dice the bread into 1 inch cubes- you'll need about 10-12 cups, enough to fill your casserole dish. Next in a large bowl, goes eggs, half & half, cinnamon, allspice and vanilla - whisk this together really well and then simply pour it over the bread. Seal it tightly with foil and tuck it into the fridge overnight. The next morning, remove it from the fridge - preheat your oven to 375 degrees and allow the casserole dish to come to room temperature (about 20 minutes) before putting it in the oven. Bake for 40 minutes covered, remove the cover and bake another 10 minutes until the crust is golden and a knife inserted into the middle comes out clean. While the French Toast is baking, slice the strawberries and put the strawberries, sugar and water in a pan on the stove over medium heat. Stir constantly until the sugar is melted. When it begins to bubble, reduce the heat to low & mash the berries with a potato masher. Continue to cook for another five minutes. Remove from the heat & set aside. 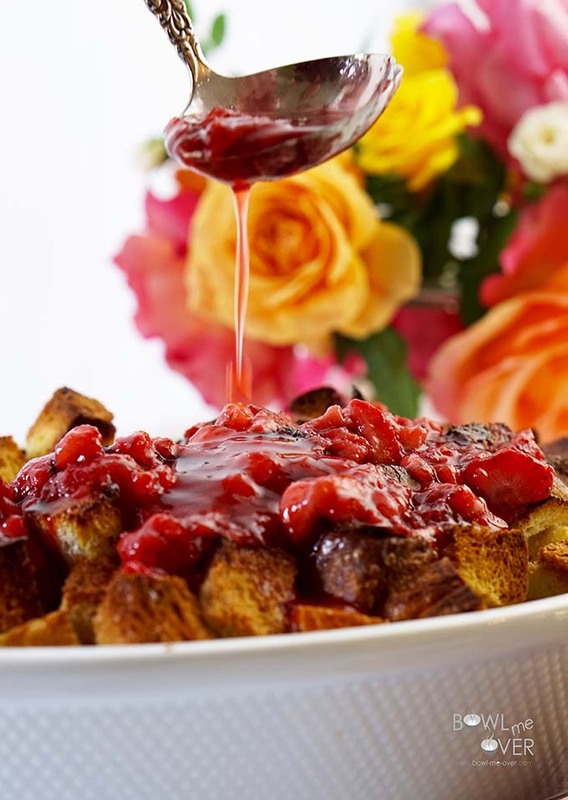 When the French Toast is done, remove it from the oven, top it with the strawberry jam and serve - you want it to be super indulgent? Top it with a dusting of powdered sugar and a dollop of whipped cream - YUM!!! 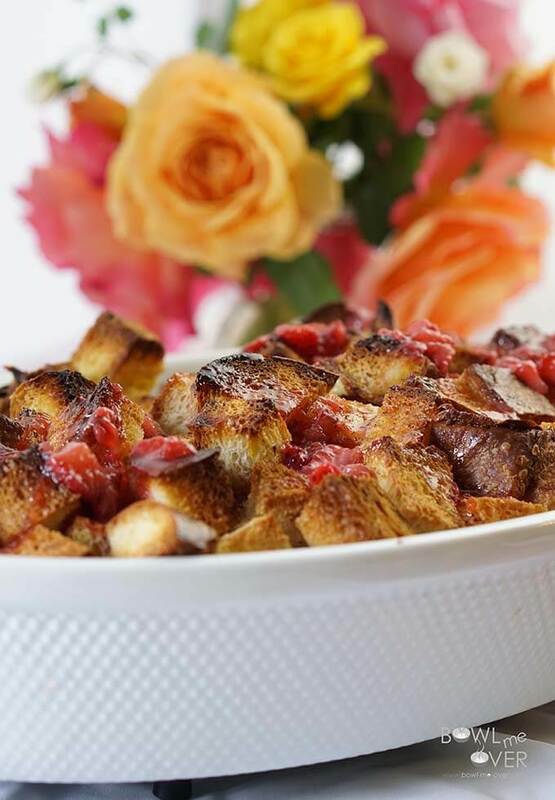 Pin to save this recipe – Baked French Toast with Strawberry Jam! The perfect French Toast for morning…. and…. lunch, and dinner… and dessert afterwards 😀 THanks for sharing this amazing recipe! You are welcome, thanks for stopping by Levan! Wonderful, I hope you give it a try Heather – pop back and let me know what you think! Perfect that makes it even easier Citra – enjoy! Delicious! The problem I have with French Toast is the mess that it makes when you want to cook it. Add my youngest son to the equation, he can make it himself, and every dish in the kitchen is used! I hope he will want to try this with me and save me an entire morning of cleaning! Yes! That sounds like a total win – good luck Jennifer! Oh my goodness, Debra, this looks amazing!! I could eat it for breakfast, lunch or dinner! 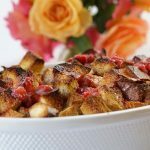 What a beautiful French Toast Casserole! Thank you so much April! We just loved this easy meal, I hope you give it a try! Looks amazing! I want a breakfast right now (yes I know it’s 3.30pm in Sweden but who cares)!? 😀 And wonderful pictures too, you did an amazing job!! I think it’s time for a road trip then, though it would be quite the ride! 😀 Regarding the pictures, it was the first pics I took using some new lights and I was so pleased with how they turned out, thank you! This looks amazing!Thanks for sharing! You are very welcome Florian – enjoy!!! Yes please!!! This one is calling my name for sure!! Cannot wait to make this for the family! Delicious, thanks for sharing with Hearth and soul blog hop, pinning and tweeting. Thank you so much for sharing Swathi, I always enjoy your party!